Fair Trade Certified™ products are made with respect to people and the planet. Rigorous social, environmental and economic standards work to promote safe, healthy working conditions, protect the environment, enable transparency, and empower communities to build strong, thriving businesses. When you choose products with the Fair Trade label, your day-to-day purchases can improve an entire community’s day-to-day lives. ​Shop with us each Sunday! Support economic justice for farmers and cooperatives around the world. by stopping at the Social Justice table on Sundays to stock up on popular Fair Trade products. Catalogs are also available containing hundreds of other products that are available to order. -- Hot cocoa mix - great in coffee! Click on the product below to open the order form. Print it, fill it out and drop it off at the Social Justice table on Sunday. You can also write the details of your order in an email and send to justice@uusarasota.org. Click here for coffee descriptions. ​Bananas are among the most concentrated industries and exploitative of workers. Equal Exchange created the only major Fair Trade banana company but it has limited distribution. Cocoa is among the largest Fair Trade sectors with 14 million small farmers dependent for the livelihood. You should avoid chocolate products from the Ivory Coast with a long history of child labor. Coffee is the largest Fair Trade sector, but is now challenged with Rust due to global warming. It is the easiest Fair Trade product to buy including at Starbucks. Cotton and sugar prices have been declining with very low wage workers. A few companies such as M&H buy organic cotton with ethical considerations. Sugar is not available for Fair Trade because of U.S. tariffs that do not allow imports. Flowers are the fastest growing Fair Trade product especially from Latin America. Tea is the most exploitive product with only two companies controlling most of the market. Similar to tea, spices are grown by small farmers but controlled by two international firms. Even Fair Trade certified tea and spice plantations may not live up to their certification requirements. Wood products are often exploited by illegal logging; certified legal lumber is available at major firms such as Lowes. Gold is another exploitive product in which it is hard to trace its sources as ethically produced. Gold mining is polluting many streams especially in the Amazon region. Equal Exchange (at UU Sunday table or online) is the most committed to small farmers, alternative trading and environmental protection. They have the largest and most sophisticated roasters in the country. 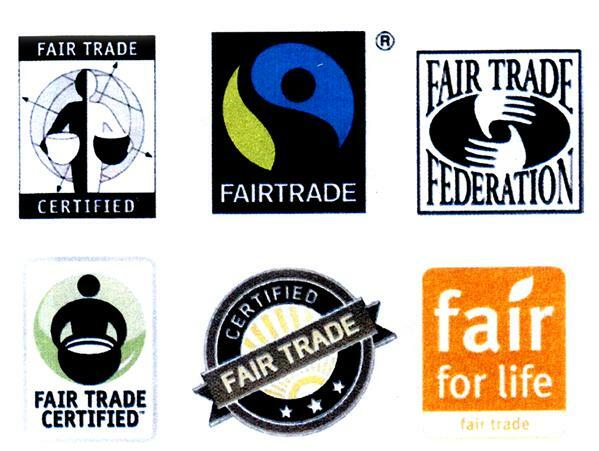 They sell coffee to Trader Joes under its brand, but it is easy to identify by the international Fair Trade symbol. Whole Foods has about 1,000 Fair Trade products including imported flowers, fruits, vegetable and bananas. They offer Fair Trade coffees (Green Mountain and Allegro Organic brands, among the most committed). They have a large array of chocolates including Equal Exchange, Theo, Newman’s Own and Devine Chocolate which are Fair Trade. However, many chocolates are not Fair Trade, so check the labels careful. Whole Foods sells Fair Trade clothing, handicrafts, soaps and other products. Many of their 360 products are Fair Trade, but again check the labels. Trader Joes has many Fair Trade products including Equal Exchange coffees (not labeled but easy to identify) chocolates, cheeses and other products. Richard’s has some Fair Trade products, but not as extensive as Whole Foods or Trader Joes. Costco and other large box stores may have some Fair Trade items, mostly coffee. Sam’s Clubs and Target have a few Fair Trade items including chocolates and wines. Publix is the least committed to Fair Trade. You may want to boycott Publix or at least complain about them as not participating in Florida Tomato Growers Exchange and its campaign for fair wages for workers. UU has led these protest efforts. ​Chocolate and Cocoa: Equal Exchange, Dean's Beans, Divine Chocolate, Ithaca Fine Chocolates, Theo, Alter Eco, Sojourn, Sweet Earth Organic Chocolates, Omanhene and Yachana Gourmet. Chocolates from Peru and Ecuador are high quality and mostly sourced from small farmers and their organizations. Coffee: Equal Exchange, Café Campesino, Alter Eco, Green Mountain Coffee, Cloudforest Initiatives, Peace Coffee, Dean's Beans, Larry's Beans, Higher Grounds Trading Co., Café Mam (Royal Blue Organics), American Joe, Just Coffee, Higher Ground Roasters, Thanksgiving Coffee Co., Grounds for Change, Fair Trade Coffee Co., Intelligent Nutrients, Cafe Canopy, Pura Vida Coffee Company, Morning Glory Coffee and Tea, Coffee-Tea-Etc., and Nectar of Life. Some sellers at the Sarasota farmers markets claim to be Fair Trade, but are not. Tea: Equal Exchange, Allegro Handcrafted Coffee, Ambassador Organics, Argo Tea Incorporated, Art of Tea, Astar Suppliers, Rishi Tea, Bhakti, Bully Blends Coffee & Tea Shop Incorporated, Cafe Moto, Cafe Virtuoso, Caravali Coffee, Celestial Seasonings, China Mist and Choice Organic Tea Granum. Garments: Boll & Branch, Colored Organics, Coyuchi, Gallant International, Good & Fair Clothing, HAE Now, Loomstate, Mountain Equipment Co-op, Fair Indigo, Mountain Khakis, Oliberte Limited HQ, PACT Apparel, Patagonia, prAna, SOL Sustained Organic Living, Under the Canopy and West Elm. If you want to be environmentally conscious, Patagonia and REI are the most environmentally committed companies. The Body Shop, Mark Spencer, Marshalls and H & M are committed to Fairtrade and organic fibers such as cotton and recycling, but there are few labels to identify them. ​Herbs and spices: Frontier Natural Products Coop, Natural Flavors Incorporated, Organic Spices, Simply Organic, Trail Lodge Tea and Whole Foods Market.